Hanover became the ninth electorate of the Holy Roman Empire in 1692. In 1714 Queen Anne (Stuart) of Great Britain died without heir, and was succeeded by George, the elector of Hanover. George's grandmother on the maternal side was Elizabeth Stuart, the second child of James I Stuart. Britain had already deposed James II in 1688 because he threatened to tear Britain apart in another religious civil war. James II's son and grandson made attempts to claim the throne in 1715 and 1745, but the Hanoverian dynasty remained solidly in place even if George I was thoroughly German in orientation and not very popular in England. (...) When Victoria became queen [of Great Britain 1837] the Hanoverian succession passed to another line. On a red field a white horse. Illustrated in Wilson 1986 p. 70. According to the Hanoverian monarchists' website [which quotes many sources], (...) prior to the end of the union with Great Britain in 1837, (...) the running red horse (the banner of arms of Hanover proper), was often unofficially used as Hanoverian flag. According to the material, this was normally with a green field under the rear legs, but I find this surprising since every version of the Hanoverian arms that I can recall has this field recall that it formed part of the British coat-of-arms since George I has the horse without the green field. According to H. Grote, Geschichte der Welfischen Stammwappen, Leipzig 1863, until 1727 Hanover (House of Braunschweig-Lüneburg) used the flag with the white horse  often erroneously depicted as a pegasus. Thereafter the British flag was used with the horse. The old flag never came out of use however and was officially tolerated again during the French occupation of the Hanover harbours 1810-1813 when the British flag was forbidden. On a red field a flying yellow horse. Illustrated in Wilson 1986, p. 70 and Smith 1975, p. 205. On a red field a flying yellow greyhound. Illustrated Encyclopedia Britannica 1771. The colours of the [Prussian] province adopted in 1887 were the same as the ones of the former kingdom: yellow over white. This flag can still be seen today, but is rarely used. the same as type 2), but with a royal crown. According to H. Grote, Geschichte der Welfischen Stammwappen, Leipzig 1863, on July 22nd 1837 the yellow and white colours (flag) were introduced by law. These colours were first used in the plumes of cavalry helmets 1790. The British red ensign (pre-1801) with the white horse at the intersection of the St. George cross. From c.1720 until 1801. According to H. Grote, Geschichte der Welfischen Stammwappen, Leipzig 1863, after 1727 Hanover (House of Braunschweig-Lüneburg) used the (...) British flag with the horse and the red cross of St. George. (...) In 1801 Hanover placed the British flag with horse in the canton of a red flag. The British red ensign with the white horse at the intersection of the St. George cross. Illustrated in Wilson 1986 p. 70. I think that the proportions were more likely to have been 5:9. The proportion 1:2 was not introduced until about 1837 which was the year that the connection between Hanover and the British monarch ended with the accession of Queen Victoria. The British Union Flag with a red square containing a white horse at intersection. This flag has a white border. Source is Siegel 1912. Gules a horse Argent [Westphalia]. Inescutcheon: Gules a traditional crown of Charlemagne or. The shield was surmounted by an electoral cap for the electorate until 1814, and a crown for the kingdom after that. The coat of arms of the Prussian province 1866-1945 and later Land 1945-1946 was Gules a horse Argent. It can still be used. Sources [for the Hanoverian royal banners and coats-of-arms]: the chapter on Britain in Smith 1975, Official Bulletin of Lower Saxony 1952, p. 169 (Nieders. GVBl. S. 169, 1952) and Rabbow 1980. The Arms of Hanover were the tierced arms of Brunswick, Lüneburg and Westphalia. The arms of Westphalia (Duchy of Westphalia and Archbishops of Cologne or Köln) had for centuries been the white horse on a red field. With the accession of George I to the throne of Great Britain, the Royal Arms were changed to accommodate the arms of Hanover in the fourth quarter. The position was altered a couple of times, and then disappeared completely [from the British royal arms] in 1837 when Victoria became queen and the Hanoverian succession passed to another line. 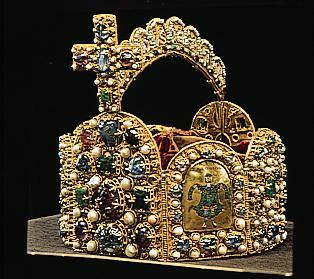 A picture of Charlemagne's crown can be found here. The image of the arms of Hanover was drawn by me from a 2-Thaler coin of that kingdom. Details were taken from Siebmachers Wappenbuch 1878 and a plate in Archiv des Hannoverischen Königshauses im Niedersächsische Staatsarchiv Hannover, reproduced in Dietmar Storch, Die hannoversche Königskrone, Hildesheim (1982) 1995. Note that the crown resembles that of Great Britain but is not the same. The greater shield is the British one. The smaller shield shows the arms of Brunswick, Lüneburg and the duchy of Saxony  the horse is supposed to be Widukinds emblem. The inescutcheon bears the crown of the Holy Roman Empire and points to the Erzschatzmeisteramt or office of the imperial treasurer.